2. Take an active part in politics. The underlying principle of all these injunctions is that Canadians must be able to communicate with each other in a common language. Our officially bilingual country (English and French) brings immigrants from more than 100 countries to become citizens. It is, however, implicit in our pluralistic society that people often speak their language of origin at home, and are able to become fluent in either or both the official languages. Indigenous languages are part of our original fabric, requiring a different support and understanding. In the 2011 census, there were more than 200 languages reported as a “home language.” Nearly six million Canadians reported speaking at least two languages at home, and seven million speak French at home. Interestingly, the rate of bilingualism in Quebec among immigrants is higher than the rate for those born in Canada. In my travels across the country I find that immigrants are keen to have their children learn both official languages. My family in the 1940s believed that French would help me get ahead. They were right. In 1999, I became the first anglophone governor-general to be fluent in French. Now, across the country, French immersion is seen to be a vital tool for immigrants to move into the mainstream. We have changed from a country that used to have “another European language” as “home language” to a country where the largest increases in “home languages” are spoken by people from Asia, North Africa and Latin America. Chinese as mother tongue leapt to one million in 2006 from 100,000 in 1971. The Indo-Pakistani languages were spoken by nearly a million Canadians in 2006 compared to 33,000 four decades before. There are 60 Indigenous language groups, divided into 12 distinct language families. Nearly a quarter-million people reported an Indigenous mother tongue and about that many reported speaking an Indigenous language regularly at home. Although there is huge diversity, three – the Cree languages, Inuktitut and Ojibway – account for almost two-thirds of the population that have an Indigenous mother tongue. In British Columbia, however, there are over 30 Indigenous mother tongues, and most are spoken by fewer than 1,000 people. The nefarious policy of the residential schools separating the children from the land, their grandparents and their ancestors was a deliberate strategy to kill their culture. When governor-general, I was visited by Indigenous leaders deeply concerned with the loss of languages and of the ability to transmit their culture through them. Indigenous peoples believe that everything belongs to those not yet born. Language is one of those things. 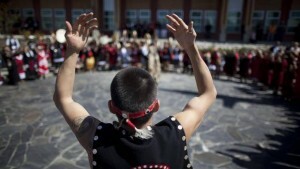 More than half of Canada’s native languages are spoken in B.C., and almost all are at risk of disappearing. Only about one in 20 Indigenous people in the province are still fluent, and most are elders. It is telling that, in the Northwest Territories, Tagalog, the language of the Philippines, is listed by more people as their mother tongue than is an Indigenous language. In New Zealand, the Maori language has come to be part of the expression of the whole culture. About 15 per cent of New Zealanders are ethnic Maoris, and seats in the legislature have been reserved for them since 1867. Through their Constitution, the proportion has increased as their population has increased. With language comes responsibility, recognition and power. Since 1985, there have been two Maori governors-general, including the current one, Jerry Mateparae. The first one, Paul Reeves, had also been the primate of the Anglican Church of New Zealand. All churches have separate streams for the Maori language and for Maori leaders. There is a profound recognition of the necessity to maintain the Maori culture, even as that culture is participating in structures that are not indigenous to them. Any visitor to New Zealand picking up a newspaper is struck by the fact that an English-language publication is filled with terms like pakeha (white) and wahine (woman) – Maori has permeated English and created a special kind of New Zealand language. In Canada, most of us know words like wampum and canoe, but there is no feeling that our Indigenous culture is as pervasive as it is in New Zealand. Not to say that New Zealand’s story is only a happy one – translated into Maori, their formative Treaty of Waitangi does not mean the same thing as it does in English. This has led to disputes and difficulties in application of the law and property and governments. In Canada, we have not really attempted to integrate Indigenous languages. We need to actively introduce key words, particularly conceptual language, into English and French, because language is the expression of a culture, and losing it is like losing the freedom to express yourself, and therefore the ability to be a citizen. Unless you speak out, you cannot be connected and you cannot make decisions as equals. The freedom to speak in one’s language indicates the equality that marks being a citizen. Democracy is not simply about laws or voting or constitutions; it is a culture of values, hopes, and means of expression and living life. As one Indigenous leader put it so eloquently, it is an invisible line from the heart into the past. Language is vital to a country like Canada, because it is the basis from which we can act. In Hannah Arendt’s phrase, we are “dead to the world” until we have learned how to express ourselves among other human beings. We cannot act until we tell our own story in our own language – and, in doing so, add to the ongoing experiment that is Canadian life today. We can learn who we are and who we were only by knowing the story of which we ourselves are the heroes. People cannot feel they belong if they do not have access to the languages in which they feel the most comfortable, even if English and French are the official languages. Cultures do not operate in a mechanical way – they flow out of personalities, experiences, beliefs and history. In Canada, we have two official languages; this has always been interpreted to mean we should be able to speak and operate in both languages. We should not be hung up on the fact that bilingualism must mean that everybody speaks every word of the other’s language perfectly. I remember being at meetings for Expo 67 in which francophones and anglophones spoke to each other in their own language, and yet were understood. In a country like South Africa, even in times of apartheid, Afrikaans and English could be understood, even if not spoken fluently by each language group. By promoting French-immersion schooling, and by creating the structures which encourage francophone minorities to stabilize themselves and begin growing again, we have reaffirmed the central role of French and of bilingualism in Canada. Surely now is the time for the same to happen with Indigenous languages. This is a national imperative. Do we really want to be responsible for the disappearance of dozens of languages proper to this place? In Canada, we’ve always been able to accept and open ourselves to others. In doing so, our sense of time and of each other becomes multidimensional and complex. This is the advantage of living in a country in which many languages are encouraged and there are two official ones. With this acceptance of many languages, we continually affirm that we are accepted as immigrants. And, we are a part of a country with its structure of parliamentary democracy, the common and civil law, public health care and public education. We must never begrudge funding for public education. Free public education is paramount to our ability to integrate an immigrant population. It is the great egalitarian principle by which we must live. It is in attending school that children – wherever they have come from, originally – acquire a sense of place in this country. It was at Kent Street and Elgin Street public schools in Ottawa that I always felt that I belonged. If we are going to continue to accommodate newcomers into society, we must continue to have well-funded public education, paid for by the state and free for all citizens. Language, either French or English, is the basis of our belonging. In the case of the Indigenous languages, there is one further element that must never be ignored: Language gives pride and identity; it gives people confidence to know their own mother tongue, and is the basis for their being able to live their lives, for being related to each other, and for knowing their histories. All Indigenous peoples deserve to have the ability to nourish their culture in order to sustain them for their continuing life in a Canada that continues to evolve and to welcome people from all over the world. No longer should Indigenous peoples feel that somehow they and their languages, and therefore their culture, have been left behind deliberately in order to favour those who came to live in this land. All of us must be aware and sympathetic to how important language is – not only for expression, but also as a continuing and evolving means of identity and the basis of citizenship. Losing one’s language is like losing all freedom of expression. It is the loss of a human right. The Right Honourable Adrienne Clarkson was the 26th Governor-General of Canada, and is the co-founder and co-chair of the Institute for Canadian Citizenship. Photo credit: John Lehmann, The Globe and Mail. Members of the Nisga’a Nation pray with fellow citizens as they sing the Nisga’a Peace song during the 10th anniversary celebration of self governance in New Aiyansh in the Nisga’a Nation May 11, 2010.